These crispy oil free teriyaki tofu stakes are easy to make and delicious. This recipe doesn’t use a bottle but instead makes a fresh teriyaki that tastes different (better) to the factory made bottles and naturally has no additives or preservatives. 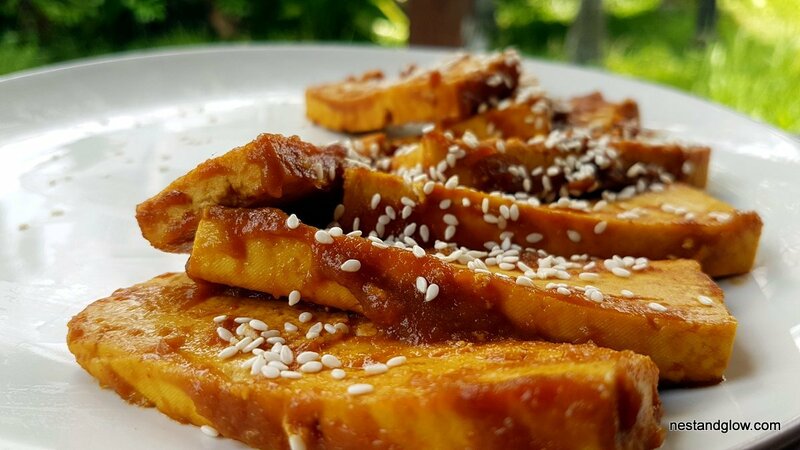 These crispy tofu stakes are so good that vegans and non-vegans alike love them. Eat on their own, in burger or as the protein part of a meal. Put everything apart from tofu and sesame into a blender and blend until smooth. 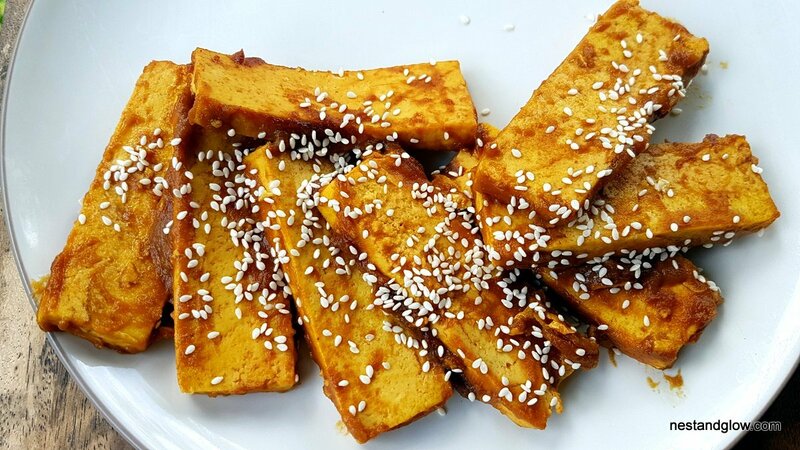 Cut the tofu into strips about ½ cm thick. Place tofu in a hot pan and dry fry for 2-3 mins then flip. Non-stick frying pan is best but if you’re using a pan that isn’t non-stick then keep the tofu moving or add a bit of water to stop it sticking. Pour in the teriyaki sauce and then flip a few times until the sauce is very thick. Use the tofu to mop up all the delicious teriyaki sauce in the pan as you take it out. In the video you can see I’m not using a non-stick pan. While you can use a regular pan it’s much easier to use a non-stick as with a regular pan you need to keep turning and jiggling the pan around so that the tofu doesn’t stick. It’s much easier to get crispy oil free tofu in a non-stick but I’m on the road at the moment, travelling minimally so using what is available. Tofu isn’t bland at all when you prepare it like this. It gives a great texture and is a sponge for the sweet spicy sour teriyaki sauce. You can just use some teriyaki sauce out of a jar but it will give a different flavour to this fresh teriyaki and it won’t be as healthy. Some don’t like a sweet and sour flavour and if this is you take out the vinegar/lemon. You can replace the rice vinegar with white vinegar or lemon juice. Ready to eat straight away or store in the fridge for a few days.